There are a few mechanics that work in the sub-3K or normal skill bracket of Dota 2 that don’t at 4K and above, and today we’re talking about how you shouldn’t be picking a support. Dota 2 has well-defined roles. If you look at the players on any pro-level team, you’ll see that each one has their own position based on farm priority, which is most commonly denoted by a number from one to five, where one is the player with the most farm, and five is the player with the last farm. Most of the time, these farm priorities match up to the role within the team, whether they’re playing the carry or one position role, the mid or two position, the offlane or three position, or one of the two supports, four and five. Seeing as I am neither a pro or playing a position within a serious team, I can say with some confidence that supports are overrated in the sub-3K MMR skill bracket. Due to the nature of the skill bracket, no-one plays the support position effectively enough for any given support pick to be worth it. In sub-3K, most of the time you’ll be more or less even on kills. Even if you’re more than ten kills up, a couple of teamfights later you could be even again. But as I’ve said before, kills don’t matter. Objectives do. Even if you’re crushing the early and mid game with as many kills as you team can accumulate, it means nothing if you can’t close the game out while you still have the advantage. Check out this recent game, for example. I had a pretty awful time in the laning stage as Spectre — for some reason Bristleback wanted to share the lane with me, which worked out as well as you can probably imagine. But it was sweet, because the Timbersaw, Pudge, and Necrophos were doing a fantastic job of ganking, picking up a few kills here and there. And when the Bristleback left the lane and started to join them, they just ran at heroes and got kills that way. Meanwhile, I was farming. Every now and again I’d press R to haunt in to join a teamfight, but as the game got later and later, the TA and Lifestealer started doing actual damage. 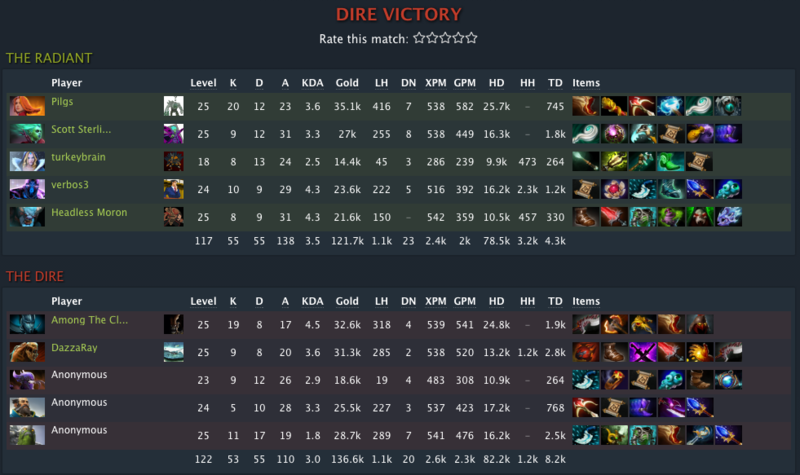 The Phoenix and Lifestealer actually picked up Midas’ pretty early, which probably explains why three heroes had a higher networth than the most farmed hero on our team (me as Spectre). At about the 35 minute mark, we stopped getting kills, got picked off every time we tried, and it was mostly down hill from there. We lost the game not because we were ahead early, but because I couldn’t keep up with the enemy team, and no-one on my team had enough of an impact later on for it to matter. Why am I so against picking supports? Because generally speaking, they have too little late-game impact. Once the enemy starts getting BKBs, your Crystal Maiden becomes good for an aura only, and even that may be negated by the items the carries on her team have already picked up. Your Venomancer ult now does less damage thanks to the pipe picked up by the Enigma that was free-farming in the jungle, and so on. You can do everything right early-game, you can get assists on enemy kills, you can put down wards and use scan to stop ganks, but come late game, you might as well be a ward. So don’t pick a support. Notice I’m not saying that people shouldn’t play like a support, but pick a hero that has some utility outside of getting killed when planting wards. Instead, pick a hero that can have some kind of impact late game, because you’ll be getting to the late game a hell of a lot in sub-3K. Bane can use Fiend’s Grip on an enemy carry with BKB activated. Beastmaster can use Primal Roar an enemy and waste their BKB duration. Ancient Apparition might be a great counter to the current strength/sustain meta of 6.87, but that’s only if you’re hitting perfect Ice Blasts every time it matters. Share the support workload. Everyone can buy wards, everyone can buy smoke or dust, and everyone can carry a TP scroll. Put out wards when it’s safe to do so, don’t get caught out, and help support your way to your team’s victory. Just don’t actually pick a support.